Many schoolboys of the early 1980’s were well aware and fascinated by the true story of huge aircraft wings being manufactured in England and then flown down to Toulouse in France for assembly to the Airbus. However both the schoolboys, and the majority of people in Brighton, will have no idea of the connection between Hollingbury and this intriguing fact! It will surprise most residents and visitors alike, that the city of Brighton, best known for tourism, conferences and entertainment, was involved at all with this story! Another surprising detail of this story is the fact that in the early 1980’s, the biggest computer controlled metal cutting Machine Tool in Europe, if not the world, was designed and built in Hollingbury. This enabled the huge aircraft wings to be manufactured in the UK using latest technology, with new cost effective production methods, before being flown to France for final assembly to the Airbus. Machine Tool manufacturer CVA/Kearney & Trecker had been in the Brighton area for many years; however the 1970’s were tough times of economic gloom, with the three-day-week, power cuts and strikes. Although at the end of the 1960’s they employed over a thousand people, the 1970’s brought consolidation of facilities and many job losses. Redundancies were announced; it seemed on a regular basis, the Company was in trouble. Also in similar trouble was Marwin Machine Tools of Leicester. Kearney & Trecker manufactured a range of general-purpose NC metal cutting machines, and a range of special purpose automotive machines, Marwin produced large aerospace aluminium routing machines. 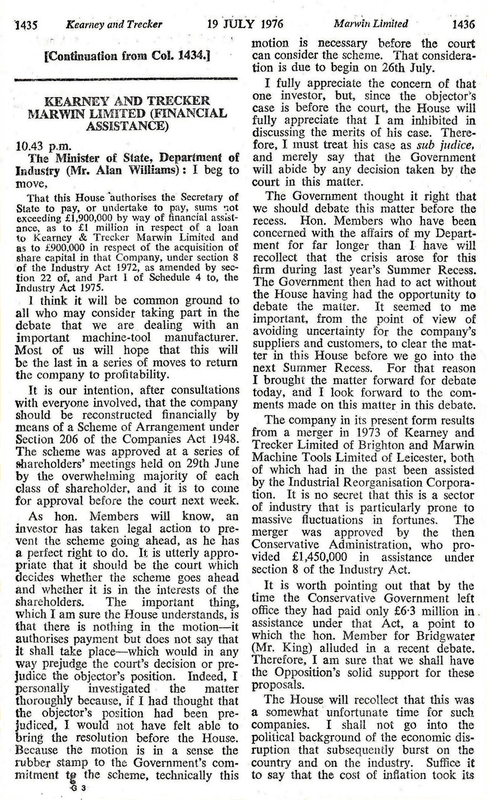 Both companies were in financial difficulties, and in 1973 a merger was approved by the then Conservative administration that provided £1,450,000 in assistance under section 8 of the Industry Act. 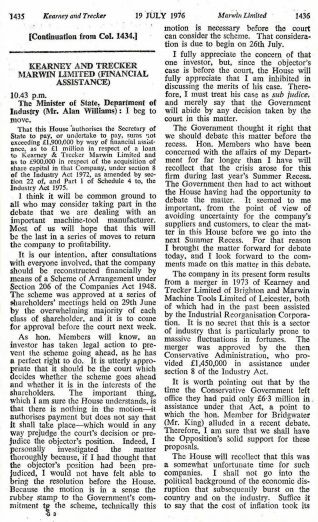 This was followed by a further £1,900,000 in 1976 under the same act, by the Labour administration. Following the merger the name was change to Kearney & Trecker Marwin (KTM). The old Marwin facilities in Leicester were gradually wound down and production of Marwin products was switched to the Hollingbury factory. Due to its large size and big overhead cranes the Hollingbury factory was well suited to the huge Marwin aerospace machines.